I traveled about 66.4 miles today. After a good night's sleep at the motel in Philip, we biked 30 miles along 14 to Wall Drug. Had fun doing the tourist thing there. and got a sticker and ice cream. After filling up on FREE ICE WATER, we were ready to travel through the badlands along highway 240. The ride through they badlands had the most stunning sights that I've seen all trip (and that includes Niagara falls). It's hard to describe how incredible this place is. One overtook that we stopped by had juniper trees growing along the slope, and the wind blew their smell across the road as we looked across a landscape that has no business existing in the middle of the plains. And when we coasted down the winding downhills, the way the foreground and background (and all the inbetween ground) shifted against each other gave an almost surreal sense of depth and three dimensionality. We took our time going through the badlands, taking lots of pictures and soaking in the sights. We met some very wonderful people at one of the overlooks who have us some cold water and fresh cherries. Such a great treat, thanks so much to those kind strangers. Arrived in Interior SD around 4, and checked into the campground there. There's a storm coming in tonight, so the owner Rick, is letting us set up camp in one of the teepees to help stay dry. Really nice, easy going guy. The campground is the badlands motel and campground, great place to stay of you're in the area. Got some good at the badlands grocery in town, the a hamburger at the wagon wheel bar next door (with horses running around their pen just outside). Took shelter from the rain inside for a while before heading back to camp. Taking a rest day tomorrow, will hike around some trails in the badlands and maybe do a short day ride. It's been fun following your journey since you left. Hopefully the Indus will die down the bulk of your trip! 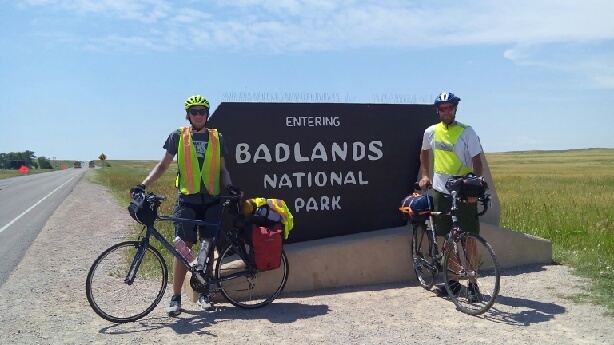 We love the Badlands too. Seems like there is anew color or formation around every bend! Will you get to go to Rushmore? Don't forget the breweries in Hill City! The views (& hills) are about to get interesting, that is after the plains of Colorado! Keep on pedaling!